Inventor Richard Browning has showcased his “Iron Man-inspired” homemade jetpack by taking off from the shore of Vancouver Harbor Thursday. 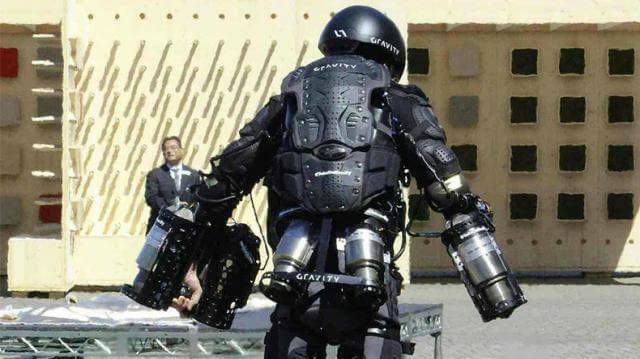 Using a suit equipped with miniature jet engines attached to a specially designed exoskeleton, the British inventor demonstrated the machine by flying in a circle for a captivated audience who were attending a TED conference in the Canadian city. “The hypothesis was that the human mind and body, if properly augmented, could achieve some pretty cool stuff,” Browning said in a speech before the demonstration. The personal flight suit can currently fly uninterrupted for around 10 minutes and Browning said it is capable of flying much higher than shown at the TED event. He said it is easily capable of flying at over 320kmph (200mph) and reaching an altitude of over 1,000ft (300 meters). The extreme athlete and engineer regaled the audience with tales of the various knocks and mishaps he experienced while building the machine. “The whole journey was about trying and failing, and learning from that,” Browning said. Gravity Industries, Browning’s startup company, recently debuted with an early-version suit called Daedalus. The company attracted huge interest when Browning posted video footage of the suit’s maiden flight. The inventor revealed that he has received attention from investors and even from the British military. However he does not think that the suit is ready for mainstream use anytime soon. “I don’t think anyone is going to be going down to Wal-Mart with it or taking anybody to school for quite a while, but the team at Gravity is moving it along,” Browning said. Browning said that his vision is a flight suit that will allow its wearer to launch from a beach, soar along the coast and then perhaps hop into a helicopter in the air to continue their journey.